Expert servicing and repairs done right every time at one of Melbourne's most trusted guitar shops. Let's face it, we're total guitar geeks here at Guitar Station! We live and breathe this stuff so we're always excited about the opportunity to help you get the most out of your instrument. Whether it's a basic re-string you need - All the way through to major remedial work - We're very capable and experienced working on all kinds of electric guitars and acoustic guitars, including precious vintage instruments. 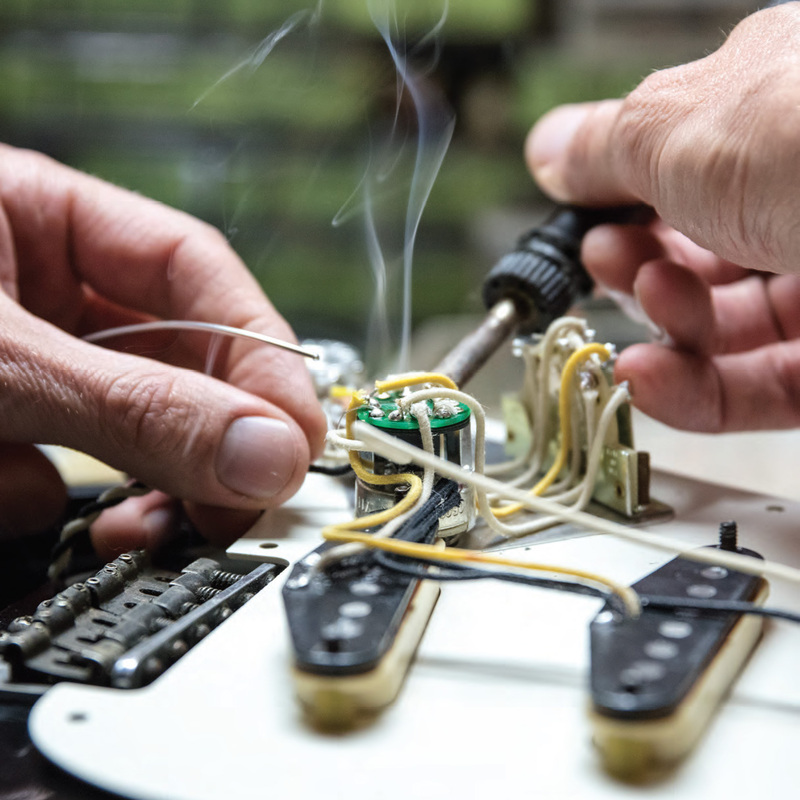 Most common and complex servicing, repair and modification work can be done here at Guitar Station, and if you happen to need something done that isn't part of our repertoire we can still hook you up with the right person for the job. Basically we don't do major woodworking and we don't do paint. If you need either of those services talk to us because we have fantastic relationships with Melbourne's very best guitar luthiers. No worries, easy done and we’ll give your guitar a quick clean while we’re at it. OK so generally your guitar plays fine but it could do with its annual spruce up to keep things running smoothly? Our Service Set-Up is all about keeping your guitar in great shape. Get the most out of your guitar and experience Melbourne’s premier guitar set-up service. Our precision fretwork is done completely by hand with your guitar strapped into an Erlewine Neck Jig to simulate string tension in the playing position (you can’t do THAT with a PLEK machine!) for the most accurate fret level possible. We offer a wide range of services but there’s also a few things we don’t do. We’re geared up to tackle most day-to-day requests for customers and if you happen to need a job done that’s not one of our specialities, we’ll definitely be able to refer you to whoever the best person in town is for your particular requirement. remove, preserve and refit the ones already on your guitar while we do the work! This is just about the only repair that doesn’t require removing strings! After installing the nut it is very important to set the guitar up properly so it plays right. Countless gigs and jam sessions have gone by, it’s time to give the old workhorse some love and make it even BETTER than when it was new!